A young girl who tried to murder a classmate because she feared fictional horror character Slender Man would kill her family has been sentenced to 25 years in a psychiatric hospital. Anissa Weier and Morgan Geyser were both 12 when they stabbed their victim, Payton Leutner, 19 times and left her for dead to please the creepy character. Despite being severely wounded, the victim, also 12 at the time, survived after she crawled to a road and was found by a cyclist. Weier, now 16, pleaded guilty in August to being a party to attempted second-degree intentional homicide following the attack in the US city of Waukesha, Wisconsin, in May 2014. But, lawyers for the teenager claimed she was not responsible for her actions because she was mentally ill.
A judge agreed that she was mentally ill in September. During the trial earlier this year, Joseph Smith, defending, told the court that Weier was deluded and had a "broken mind", causing her to lose touch with reality. She believed she was serving as a proxy for the supernatural character. Mr Smith told the jury that three psychological experts concluded that Weier and Geyser shared a delusion. He said Weier helped Geyser try to murder their victim but she shouldn't be held criminally responsible because she believed that Slender Man would kill her or her family if she didn't. On Thursday, Judge Michael Bohren, of the Waukesha County circuit, sentenced Weier to 25 years in a psychiatric institution. She will be institutionalised until she is 37. Weier addressed the court briefly before her sentencing to apologise. She told the judge: "I do hold myself accountable for this and that I will do whatever I have to do to make sure I don’t get any sort of delusion or whatever again. "I want everybody involved to know I deeply regret everything that happened that day. I know that nothing I say is going to make this right and nothing I say is going to fix what I broke." For the upcoming film, see Slender Man (film). The Slender Man (also known as Slenderman) is a fictional supernatural character that originated as a creepypasta Internet meme created by Something Awful forums user Eric Knudsen (also known as "Victor Surge") in 2009. It is depicted as a thin, unnaturally tall man with a featureless head and face, wearing a black suit. The writings of H. P. Lovecraft (left) and William S. Burroughs (right) influenced the creation of the Slender Man. These additions effectively transformed the photographs into a work of fiction. Subsequent posters expanded upon the character, adding their own visual or textual contributions. Knudsen was inspired to create the Slender Man primarily by Zack Parsons' "That Insidious Beast", Stephen King's The Mist, reports of shadow people, Mothman and the Mad Gasser of Mattoon. Other inspirations for the character were the Tall Man from the 1979 film Phantasm, H. P. Lovecraft, the surrealist work of William S. Burroughs, and the survival horror video games Silent Hill and Resident Evil.Knudsen's intention was "to formulate something whose motivations can barely be comprehended, and [which caused] unease and terror in a general population." Other pre-existing fictional or legendary creatures which are similar to the Slender Man include: the Gentlemen, black-suited, pale, bald demons from the Buffy the Vampire Slayer episode "Hush"; Men in black, many accounts of which grant them an uncanny appearance with an unnatural walk and "oriental" features; and The Question, a DC Comics superhero with a blank face, whose secret identity is "Victor Sage", a name similar to Knudsen's alias "Victor Surge". The Slender Man soon went viral, spawning numerous works of fanart, cosplay, and online fiction known as "creepypasta": scary stories told in short snatches of easily copyable text that spread from site to site. Divorced from its original creator, the Slender Man became the subject of myriad stories by multiple authors within an overarching mythos. Many aspects of the Slender Man mythos first appeared on the original Something Awful thread. One of the earliest additions was added by a forum user named "Thoreau Up", who created a folklore story set in 16th-century Germany involving a character called Der Grossman, which was implied to be an early reference to the Slender Man. [page needed] The first video series involving the Slender Man evolved from a post on the Something Awful thread by user "ce gars". It tells of a fictional film school friend named Alex Kralie, who had stumbled upon something troubling while shooting his first feature-length project, Marble Hornets. The video series, published in found footage style on YouTube, forms an alternate reality game describing the filmers' fictional experiences with the Slender Man. The ARG also incorporates a Twitter feed and an alternate YouTube channel created by a user named "totheark". As of 2013, Marble Hornets had over 250,000 subscribers around the world, and 55 million views. Other Slender Man-themed YouTube serials followed, including EverymanHYBRID and TribeTwelve. In 2012, the Slender Man was adapted into a video game titled Slender: The Eight Pages; within its first month of release, the game was downloaded over 2 million times. Several popular variants of the game followed, including Slenderman's Shadow and Slender Man for iOS, which became the second most-popular app download. The sequel to Slender: The Eight Pages, Slender: The Arrival, was released in 2013. Several independent films about the Slender Man have been released or are in development, including Entity and The Slender Man, released free online after a $10,000 Kickstarter campaign. In 2013, it was announced that Marble Hornets would become a feature film. In 2015, the film adaptation, Always Watching: A Marble Hornets Story, was released on VOD. In 2016, Sony Pictures subsidiary Screen Gems partnered with Mythology Entertainment to bring a Slender Man film into theatres. Because the Slender Man's fictional "mythology" has evolved without an official "canon" for reference, his appearance, motives, habits, and abilities are not fixed, but change depending on the storyteller. He is most commonly described as very tall and thin with unnaturally long, tentacle-like arms (or merely tentacles), which he can extend to intimidate or capture prey. In most stories his face is white and featureless, but occasionally his face appears differently to anyone who sees it.He appears to be wearing a dark suit and tie. The Slender Man is often associated with the forest and/or abandoned locations and has the ability to teleport. Proximity to the Slender Man is often said to trigger a "Slender sickness"; a rapid onset of paranoia, nightmares and delusions accompanied by nosebleeds. Early stories featured him targeting children or young adults. Some featured young adults driven insane or to act on his behalf, while others did not, and others claim that investigating the Slender Man will draw his attention. [page needed] The web series Marble Hornets established the idea of proxies (humans who fall under the Slender Man's influence) though initially they were simply violently insane, rather than puppets of the Slender Man. Marble Hornets also introduced the idea that the Slender Man could interfere with video and audio recordings, as well as the "Slender Man symbol", which became a common trope of Slender fiction. [page needed] Graphic violence and body horror are uncommon in the Slender Man mythos, with many narratives choosing to leave the fate of his victims obscure. [page needed] Shira Chess notes that "It is important to note that few of the retellings identify exactly what kind of monster the Slender Man might be, and what his specific intentions are- these points all remain mysteriously and usefully vague." Andrew Peck also considers the Slender Man to be an authentic form of folklore and notes its similarity to emergent forms of offline legend performance. Peck suggests that digital folklore performance extends the dynamics of face-to-face performance in several notable ways, such as by occurring asynchronously, encouraging imitation and personalization while also allowing perfect replication, combining elements of oral, written, and visual communication, and generating shared expectations for performance that enact group identity despite the lack of a physically present group. He concludes that the Slender Man represents a digital legend cycle that combines the generic conventions and emergent qualities of oral and visual performance with the collaborative potential of networked communication. Jeff Tolbert also accepts the Slender Man as folkloric and suggests it represents a process he calls “reverse ostension.” Ostension in folkloristics is the process of acting out a folk narrative. According to Tolbert, the Slender Man does the opposite by creating a set of folklore-like narratives where none existed before. It is an iconic figure produced through a collective effort and deliberately modeled after an existing and familiar folklore genre. According to Tolbert, this represents two processes in one: it involves the creation of new objects and new disconnected examples of experience, and it involves the combination of these elements into a body of “traditional” narratives, modeled on existing folklore (but not wholly indebted to any specific tradition). Professor Thomas Pettitt of the University of Southern Denmark has described the Slender Man as being an exemplar of the modern age's closing of the "Gutenberg Parenthesis"; the time period from the invention of the printing press to the spread of the web in which stories and information were codified in discrete media, to a return to the older, more primal forms of storytelling, exemplified by oral tradition and campfire tales, in which the same story can be retold, reinterpreted and recast by different tellers, expanding and evolving with time. Media scholar and folklorist Andrew Peck attributes the success of the Slender Man to its highly collaborative nature. Because the character and its motives are shrouded in mystery, users can easily adapt existing Slender Man tropes and imagery to create new stories. This ability for users to tap into the ideas of others while also supplying their own helped inspire the collaborative culture that arose surrounding the Slender Man. Instead of privileging the choices of certain creators as canonical, this collaborative culture informally locates ownership of the creature across the community. In these respects, the Slender Man is similar to campfire stories or urban legends, and the character's success comes from enabling both social interaction and personal acts of creative expression. Although nearly all users understand that the Slender Man is not real, they suspend that disbelief in order to become more engrossed when telling or listening to stories. This adds a sense of authenticity to Slender Man legend performances and blurs the lines between legend and reality, keeping the creature as an object of legend dialectic. This ambiguity has led some to some confusion over the character's origin and purpose. Only five months after his creation, George Noory's Coast to Coast AM, a radio call-in showdevoted to the paranormal and conspiracy theories, began receiving callers asking about the Slender Man. Two years later, an article in the Minneapolis Star Tribune described his origins as "difficult to pinpoint." Eric Knudsen has commented that many people, despite understanding that the Slender Man was created on the Something Awful forums, still entertain the possibility that he might be real. Despite his folkloric qualities, the Slender Man is not in the public domain. Several for-profit ventures involving the Slender Man have unequivocally acknowledged Knudsen as the creator of this fictional character, while others were civilly blocked from distribution (including the Kickstarter-funded film) after legal complaints from Knudsen and other sources. Though Knudsen himself has given his personal blessing to a number of Slender Man-related projects, the issue is complicated by the fact that, while he is the character's creator, a third party holds the options to any adaptations into other media, including film and television. The identity of this option holder has not been made public.Knudsen himself has argued that his enforcement of copyright has less to do with money than with artistic integrity: "I just want something amazing to come off it... something that's scary and disturbing and kinda different. I would hate for something to come out and just be kinda conventional." As of May 2016, the media rights to Slender Man have been sold to production company Mythology Entertainment. On May 31, 2014, two 12-year-old girls in Waukesha, Wisconsin allegedly held down and stabbed a 12-year-old classmate 19 times. When questioned later by authorities, they reportedly claimed that they wished to commit a murder as a first step to becoming proxies for the Slender Man, having read about it online. They also state that they were afraid that Slender Man would kill their families if they did not commit the murder. The victim was able to crawl from the woods, where she had been left, to reach a roadside. A passing cyclist intervened, and the victim survived the attack. Both attackers have been diagnosed with mental illnesses but have also been charged as adults and are each facing up to 65 years in prison. One of the girls reportedly said Slender Man watches her, can read minds, and could teleport. In a statement to the media, Eric Knudsen said, "I am deeply saddened by the tragedy in Wisconsin and my heart goes out to the families of those affected by this terrible act." He stated he would not be giving interviews on the matter. On 25 September, 2017, it was reported that Morgan Geyser, then 15, had agreed to plead guilty to attempting to commit first-degree homicide in an arrangement that would allow her avoid jail time. In terms of the arrangement Geyser would remain at the mental hospital where she had been staying for the past two years for at least a further three years. A documentary film on the incident called Beware the Slenderman was released by HBO Films in March 2016, and was broadcast on HBO on January 23, 2017. After hearing the story, an unidentified woman from Cincinnati, Ohio, told a WLWT TV reporter in June 2014 that her 13-year-old daughter had attacked her with a knife, and had written macabre fiction, some involving the Slender Man, who the mother said motivated the attack. On September 4, 2014, a 14-year-old girl in Port Richey, Florida, allegedly set her family's house on fire while her mother and nine-year-old brother were inside. Police reported that the teenager had been reading online stories about Slender Man as well as Atsushi Ōkubo's manga Soul Eater. Eddie Daniels of the Pasco County Sheriff's Office said the girl "had visited the website that contains a lot of the Slender Man information and stories [...] It would be safe to say there is a connection to that." During an early 2015 epidemic of suicide attempts by young people ages 12 to 24 on the Pine Ridge Indian Reservation, Slender Man was cited as an influence; the Oglala Sioux tribe president noted that many Native Americans traditionally believe in a "suicide spirit" similar to the Slender Man. In 2011, Markus "Notch" Persson, creator of the sandbox indie game Minecraft, added a new hostile mob to the game, which he named the "Enderman" when multiple users on Reddit and Google+ commented on the similarity to the Slender Man. The Slender Man was the antagonist of the 2013 Lost Girl episode "SubterrFaenean", in which the Slender Man was said to be the basis for the Pied Piper legend. In the 2014 episode "Pinkie Apple Pie" of My Little Pony: Friendship is Magic, a pony version of the character appears in a brief cameo. The TV series Supernatural parodied Slender Man as "Thinman" in the 2014 episode of the same name. In 2016, American horror punk band Haunted Garage released an EP entitled Slenderman and Other Strange Tales, featuring a song and accompanying music video based on both the character and the 2014 stabbing case. The sixteenth season of the crime drama TV series Law & Order: Special Victims Unit featured an episode, "Glasgowman's Wrath", inspired by the Slender Man stabbings. Jump up^ Dewey, Caitlin; Dewey, Caitlin (2014-06-03). "The complete history of 'Slender Man,' the meme that compelled two girls to stab a friend". The Washington Post. ISSN 0190-8286. Retrieved 2017-06-21. ^ Jump up to:a b c De Vos, Gail Arlene (2012). What Happens Next?. ABC-CLIO. p. 162. ISBN 9781598846348. ^ Jump up to:a b c Romano, Aja (October 31, 2012). "The definitive guide to creepypasta—the Internet's urban legends". The Daily Dot. Retrieved 2013-04-22. Jump up^ "Slender Man: Birth of an Urban Legend". The Escapist. Retrieved 2017-06-21. Jump up^ "Slender Man: How a myth was born". Tampa Bay Times. Retrieved 2017-06-21. 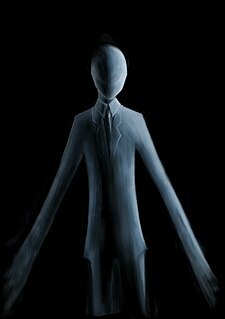 Jump up^ "What is Slenderman, and what does it have to do with the Wisc. stabbing?". NY Daily News. Retrieved 2017-06-21. ^ Jump up to:a b Klee, Miles (August 21, 2013). "How the Internet's creepiest meme mutated from thought experiment to Hollywood blockbuster". The Daily Dot. Retrieved 2013-11-18. ^ Jump up to:a b c Chess, Shira (2012). 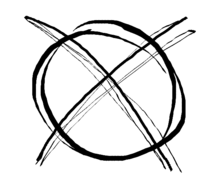 "Open-Sourcing Horror: The Slender Man, Marble Hornets, and genre negotiations". Information, Communication & Society. 15 (3): 374–393. doi:10.1080/1369118X.2011.642889. ^ Jump up to:a b c d Dane, Patrick (October 31, 2012). "Why Slenderman Works: The Internet Meme That Proves Our Need To Believe". Retrieved 2013-02-20. Jump up^ Walsh, Shannon (April 17, 2015). "Victor Surge, Slender Man Creator: 5 Fast Facts You Need to Know". Heavy.com. Retrieved 2016-08-05. ^ Jump up to:a b c d e f g h i Chess, Shira; Newsom, Eric (27 November 2014). Folklore, Horror Stories, and the Slender Man: The Development of an Internet Mythology. Palgrave Macmillan US. pp. 58–59. ISBN 978-1-137-49113-8. Jump up^ Lovitt, Bryn (August 3, 2016). "Slender Man: From Horror Meme to Inspiration for Murder". Rolling Stone. Retrieved August 5, 2016. Jump up^ Robinson, Joanna (January 28, 2016). "American Horror Story and Slender Man: The 5 Most Spine-Tingling Inspirations for Next Season's Potential Monster". Vanity Fair. Retrieved 2016-08-11. Jump up^ There is some dispute over whether the Slender Man qualifies as a viral phenomenon, since under some definitions, viral phenomena must spread quickly, while the Slender Man initially spread rather slowly. Some therefore prefer the term "spreadable" to viral. See Chess, Shira; Newsom, Eric (2015). Folklore, Horror Stories, and the Slender Man: The Development of an Internet Mythology. p. 20. Jump up^ Peters, Lucia (May 14, 2011). "Creepy Things That Seem Real But Aren't: The Marble Hornets Project". Crushable. Retrieved 2012-10-09. ^ Jump up to:a b McNary, Dave (February 25, 2013). "'Marble Hornets' flying to bigscreen". Variety. Retrieved 2013-02-26. Jump up^ Marston, Gary (2012). "Slender review". explosion.com. Retrieved 2013-04-22. Jump up^ Polansky, Lana (August 20, 2012). "Slenderman's Shadow "Sanatorium" Map Released". Gameranx. Retrieved 2012-09-09. Jump up^ Senior, Tom (July 26, 2012). "Slender Man Source mod will let you scare the hell out of yourself for free, with friends". PC Gamer. Retrieved 2012-09-09. Jump up^ Matulef, Jeffrey (February 11, 2013). "Pre-orders for Slender: The Arrival are half-off, come with instant beta access". Eurogamer. Retrieved 2013-04-03. Jump up^ Standal, Jeanne (December 22, 2012). "First Trailer & Poster For The Jadallah Brothers' Horror Movie ENTITY!". FilmoFilia. Retrieved 2013-02-20. Jump up^ Gallagher, Danny (October 12, 2012). "Slender Man Movie Producer Steven Belcher Wants to Create True Terror with the Faceless Figure". GameTrailers. Retrieved 2013-02-20. Jump up^ Clow, Mitchel. "'Always Watching: A Marble Hornets Story' movie review: Tell, don't show". Hypable. Retrieved 26 September 2015. ^ Jump up to:a b Rogers, Katie (2016). "'Slender Man,' a Horror Meme, Gets Ready to Step Out of the Shadows". The New York Times. Retrieved 2016-05-07. ^ Jump up to:a b c d e Dewey, Caitlin (June 3, 2014). "Who is Slender Man?". The Boston Globe. Retrieved 2014-06-04. ^ Jump up to:a b c d "Digital Human: Tales". BBC. 2012. Retrieved 2013-02-20. Jump up^ Tillotson, Kristin (April 27, 2011). "Tall, skinny, scary—and all in your head". startribune.com. Retrieved 2013-02-23. Jump up^ Stampler, Laura (June 3, 2014). "The Origins of Slender Man, the Meme That Allegedly Drove 12-Year-Olds to Kill". Time. Retrieved 2014-06-04. ^ Jump up to:a b c Peck, Andrew (2015). "Tall, Dark, and Loathsome: The Emergence of a Legend Cycle in the Digital Age". Journal of American Folklore. 128 (509): 333–348. doi:10.5406/jamerfolk.128.509.0333. ^ Jump up to:a b Tolbert, Jeffrey A. (2013). "The sort of story that has you covering your mirrors":The Case of Slender Man" (PDF). Semiotic Review(2). Retrieved 13 July 2015. Jump up^ Ellis, Bill (2001). Aliens, Ghosts, and Cults: Legends We Live. Jackson: University Press of Mississippi. ^ Jump up to:a b Vogt, PJ; Goldman, Alex (January 30, 2014). "#13 - Managing a Monster - On The Media". TLDR. Retrieved 2014-06-04. Jump up^ Van Horn, Tye (February 15, 2013). "Behind You: The Cultural Relevance of Slender Man". Retrieved 2013-02-20. ^ Jump up to:a b Gabler, Ellen (June 2, 2014). "Charges detail Waukesha pre-teens' attempt to kill classmate". Milwaukee Journal Sentinel. Retrieved 2014-06-04. Jump up^ "If These Girls Knew That Slender Man Was a Fantasy, Why Did They Want to Kill Their Friend for Him?". 2015-08-25. Retrieved 2016-06-30. Jump up^ Dunlap, Bridgette (July 29, 2016). "Slender Man Trial". RollingStone.com. Jump up^ Terry, Jermont; Kust, James (May 31, 2014). "Girls charged in Waukesha stabbing motivated by 'Slenderman' character". WTMJ. Retrieved 2014-06-03. Jump up^ Vielmetti, Bruce; Luthern, Ashley (2014-08-01). "Judge rules 12-year-old incompetent, for now, in Slender Man trial". Journal Sentinel. Milwaukee, Wisconsin. Retrieved 2014-08-02. Jump up^ "Doctor claims girl, 12, 'who repeatedly stabbed classmate to impress Slender Man' has improved enough to stand trial". Mail Online. London. 2014-11-12. Retrieved 2014-11-14. Jump up^ Varandani, Suman (2014). "Slender Man Stabbing Case: Wisconsin Girls Accused Of Attempted Homicide Are Mentally Fit To Stand Trial". International Business Times. Retrieved 2015-01-05. Jump up^ "Slender Man case: Young suspects to be tried as adults". BBC News. 2015-08-10. Retrieved 14 August 2015. Jump up^ "Separate trials ordered in Slender Man case". Milwaukee Journal Sentinel. Retrieved December 14, 2016. Jump up^ "Slender Man stabbing suspect pleads guilty to lesser charge". cbsnews.com. CBS. Retrieved 2017-08-21. Jump up^ "Slender Man stabbing: Anissa Weier found mentally ill". BBC News. September 15, 2017. Jump up^ "Jury in Slender Man case finds Anissa Weier was mentally ill, will not go to prison". WISN-TV 12 ABC News. Milwaukee. September 16, 2017. 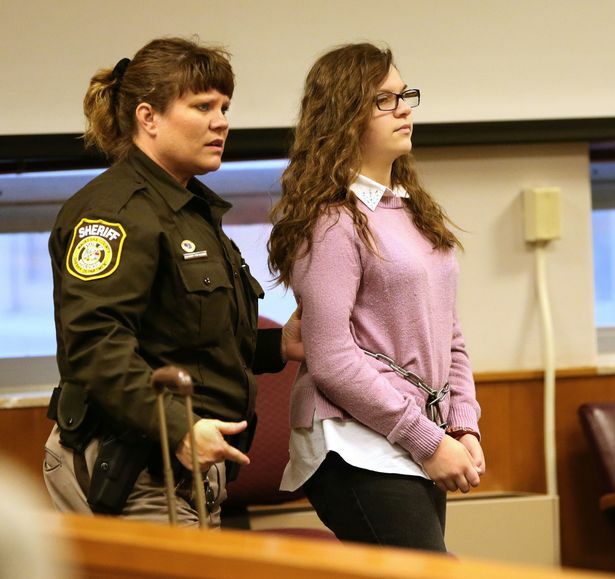 Jump up^ "Slender Man case: girl who stabbed classmate gets 25-year hospital sentence". The Guardian. Retrieved 2017-12-22. Jump up^ Wagstaff, Keith (June 4, 2014). "'Slender Man' Creator Speaks on Stabbing: 'I Am Deeply Saddened'". nbc.com. Retrieved 2014-06-04. Jump up^ "Slender Man suspect will plead guilty in stabbing". nbcnews.com. Jump up^ DePaol, Tommy. "Slenderman Is Coming to HBO In A True-Crime Documentary". MoviePilot.com. Retrieved 21 April 2016. Jump up^ Evans, Brad (June 6, 2014). "Hamilton Co. mom: Daughter's knife attack influenced by Slender Man". WLWT.com. Jump up^ Melrose, Kevin. "Teen claims 'Soul Eater,' Slender Man led her to set home on fire". Comic Book Resources. Retrieved 7 February2015. Jump up^ Murray, Rheana (2014-09-05). "Teen Inspired by 'Slender Man' Set House on Fire: Police". ABC News. Retrieved 2014-09-05. Jump up^ Bosman, Julie (May 1, 2015). "Pine Ridge Indian Reservation Struggles With Suicides Among Its Young". The New York Times. Retrieved May 5, 2015. Jump up^ "Notch reveals new mob, dubs them Endermen in reference to Slender Man". igx.com. 2011. Retrieved 2013-02-21. Jump up^ Lost Girl: SubterrFaenean Syfy. 2014. Accessed 2015-18-02. Jump up^ Scotellaro, Shaun (2014). "Top 20 Pop Culture and Movie References from Season 4". Equestria Daily. Retrieved 2016-08-23. Jump up^ Supernatural: "Thinman" The A.V. Club. 2014. Accessed 2016-28-01. Jump up^ "Haunted Garage: 'Slenderman and Other Strange Tales'". Zombie Hamster. January 13, 2016. Jump up^ Gerson Uffalussy, Jennifer (2014). "Law & Order: SVU bends the conventions of the cop show". The Guardian. Retrieved 2016-01-29. Curlew, Kyle (2017). "The legend of the Slender Man: The boogieman of surveillance culture". First Monday. 22 (6). doi:10.5210/fm.v22i6.6901. Wikimedia Commons has media related to Slender Man.